Viewing only articles authored by wicko. Following the PS3 4.80 Firmware update, today PlayStation 3 developer Orion has updated the PS3 Backup Game Manager to GameSonic Manager v3.90 for PS3 CFW 4.80 followed by a fixed version below. Discless updated file with the CFW 4.80 properly patched. Updated and integrated the mamba payload for CFW 4.80. 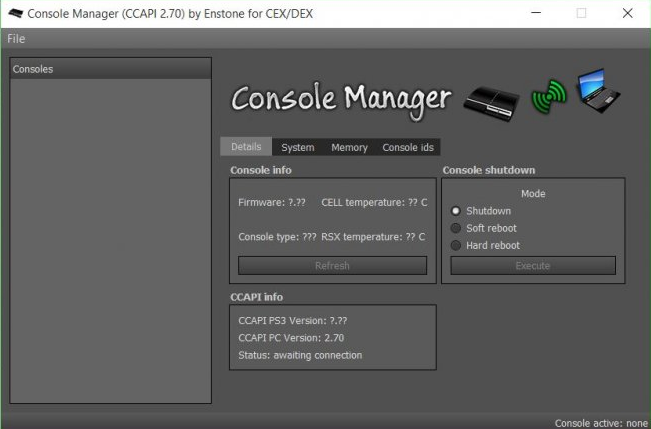 Following his previous release, PlayStation 3 developer @deank updated the PS3 backup game manager to MultiMAN version 04.78.03 BASE (20160425) and UPD CEX for Custom Firmware (CFW) users. StDISC updated with support for custom firmware 4.75-478. NEW !! Fixed a bug in the FLASH / LV1 / LV2 for Custom Firmware 4.66 / 4.76 / 4.78. Fixed patching for EBOOT.BIN / SPRX for Custom Firmware 4.66 / 4.76 / 4.78. Following the previous updates, PlayStation 3 developer @Alexanderss returns with 4.80 FERROX CFW v1.00 (Standard CEX) which supports PS3 4.80 Firmware with details below. Following their previous update, today a new PS3 CFW release comes from Team REBUG as they officially release Rebug 4.78.2 that comes equipped with Cobra v7.3 features. What's new since 4.78.1 REX/D-REX? It's now Apr 21, 2019 at 10:36 AM.